Hey, it is called HAPPY Hour for a reason, people! Sure, it may be more than an hour long, but it does pretty much guarantee happiness. And what’s not to smile about? You get cheap booze, free bar snacks (some places go all out – not just nachos! ), menu specials, and a bunch of people that gather for these goodies to get happy! 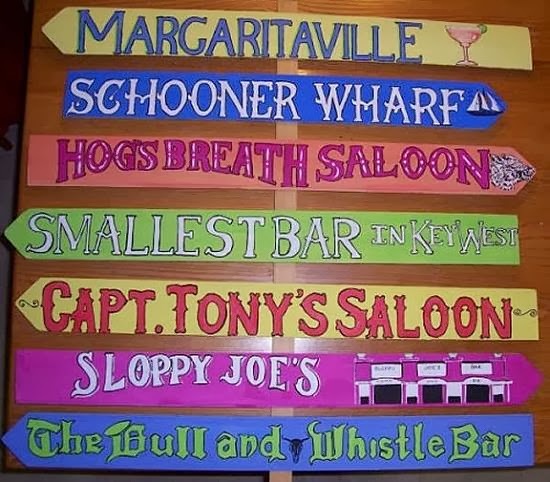 Happy hour is a great way to blow off steam after a long day at work, or if you are on vacation in Key West , it is an even better afternoon way to segue between the day’s amazing tourist events and the happening nightlife to come. You can usually find locals and tourists mingling together, so it is a great way to meet people on your Key West getaway. There are lots of bars and pubs in glorious Key West to get your drink on, but we believe this Top 10 has the most happening Happy Hours of all. This is an old school Key West joint: located on the water, wooden picnic tables, fishmen unloading the day’s catch in the restaurants fish market, and a totally happening Happy Hour including some of the best catches of the day. Another waterfront eatery, the Commodore boasts breathtaking views of sky and sea—sit and watch the boats come in and enjoy fresh breezes blowing in off the water. 50% off Happy Hour specials make it a no-brainer. as the tourists. Fresh seafood is delivered daily to the restaurant’s docks, and Happy Hour is filled with 2-for-one’s galore. Get your drink and food on and meet new friends! What would a trip to Key West be without a stop at Jimmy Buffett’s famous bar?? It is right on Duval Street, the main drag of the island, so you will be right in the middle of all the fun. There are 2 Happy Hours here: 5-7PM and 10pm-midnight, so you can enjoy $3 beers and the famous Cheeseburger in Paradise to your heart’s content. You will just love this place: there is a magical outdoor garden area to dine, and a hopping bar where you can enjoy awesome craft beer, friendly bartenders and great food deals. This one is a wine bar (as you can tell by the name), and offeres a slightly different vibe than the pub scene. It is romantic, has a great outdoor porch to people watch, has a great sangria Happy Hour, great wine and craft beer, and they even offer blankets to patrons to snuggle up while sitting at the bar! I mean come on, what’s not to adore? Fine wines, perfect martini’s, this is happy hour for grown-ups. Located in a Victorian mansion on Duval but set apart from the hustle and bustle, you are guaranteed a sweet time at the back bar. Enjoy half price beer, wine and martini’s as well as delicious light fare. This saloon is a newer one and located in Old Town on Duval Street. There’s live music, a happening raw bar, sweet drink specials, and a totally fun time. This is the place to go to get your party on! This world-famous watering hole is a must-drink-at stop. There is a great, outdoor covered patio, live music, dancing, drinks are flowing and it’s always a party at the Hog’s Breath. This place is uber-casual, wild and raucous—it’s a sand-still-in-your-toes kind of watering hole. Come on in in your flip-flops and enjoy flowing frozen drinks, deli sandwiches and pizza, live music, 25 flatscreen sports TVs, and probably a few people dancing on the bar. Happy Hour is as happy as you can get! Follow Marjorie’s board Key West on Pinterest.